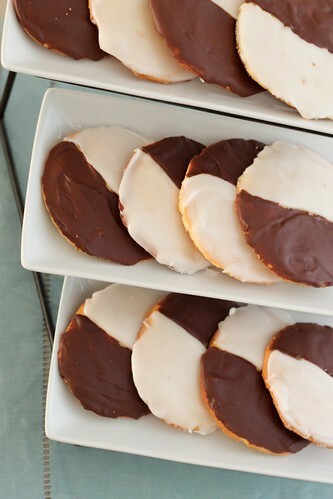 When I first started this blog, I remember thinking that a great first post would be black and white cookies. I had even started writing about how great they were and why I loved them, but then for some reason I never got around to actually making them. Then when I saw these cookies on 2 of my favorite blogger’s sites a few weeks ago, I decided that I absolutely had to make them. 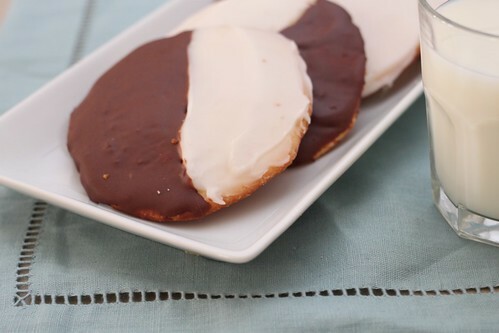 I have a long history with the black and white cookie, which began at a coffee and bake shop near our college campus called Mad Hatters. I used to go to this place from time to time to get away from the usual drone of the library, and it became a favorite place to study one summer when I was taking organic chemistry. 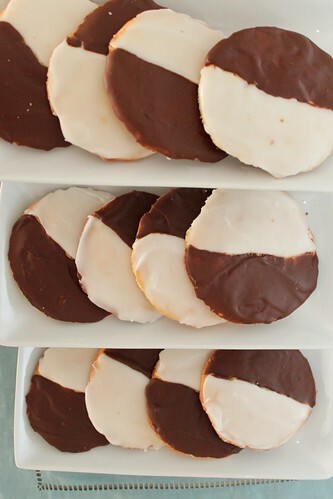 You might wonder why I would decide on a plain black and white cookie when there was an entire case full of delicious baked goods to chose from. Well that’s simple – as a poor college student an absolutely gigantic cookie (like small dinner plate size), complete with both chocolate and vanilla icing icing that cost less than $1.50 was pretty much too good to pass up. (In fact it might have actually been been too good to be true, because according to mad hatter’s website, it seems that they no longer offer this cookie. Sad.). Now in all honesty, when I first bought this, I definitely thought it was just a simple sugar cookie with icing on top. I think I might have been slightly disappointed when I first ate it and realized it was more cake like than the dense and buttery cookie I was expecting. However, it quickly became one of my favorite cookies of all time. Unfortunately, I don’t have any pictures to show you of the steps getting up to the final product because I got slightly discouraged about halfway through making these. I was sure they were going to turn out terribly, but once I got to the final product, I ended up loving it and decided I definitely needed to share! A few hints so that you don’t get discouraged like I did: First the original recipe called for 20 minutes in the oven. I pulled them out a few minutes early and they were still slightly overdone, so I really think 15 minutes would be more than enough baking time. Secondly, I let the un-iced cookies cool slightly and then packaged them into a ziplock bag. When I took the cookies out the next morning they were stuck together, and when I pulled them apart it left an uneven surface on the cookies. Therefore, I would recommend not stacking the cookies, or using parchment paper between them. And finally, I ran out of icing and had to heat up some more about 3/4 of the way through. I adjusted the recipe below so that it should be more than enough icing to cover the cookies. With those suggestions, I think that these are a fairly simple to make cookie that gives a delicious and stunning result. The slight lemon flavor is a perfect complement to both the vanilla and chocolate icing. It also makes a great study snack. It’s just dangerous having more than 1 of these easily available, so be sure to share. 1. Preheat the oven to 375˚ F. Line 2 large baking sheets with parchment paper or silicon baking mats. 2. In a large bowl combine the flour, baking powder and salt. Whisk to combine, and set aside. 3. In the bowl of an electric mixer, beat the butter on medium speed until smooth and creamy. With the mixer on medium-high add in the sugar gradually, beating until light and fluffy, about 3 minutes. Blend in the eggs, vanilla and lemon extracts at medium speed until combined, about 30 seconds. 4. With the mixer on low speed, gradually add the flour mixture and then the milk, alternating about 3 times until just combined. Batter will be thin. 5. Using a ¼-cup measuring cup or an ice cream scoop, place mounds of dough several inches apart on the baking sheet. I could only fit 6 per sheet. With moistened fingers, spread the mound of dough into a disk about 2½ inches wide and ¾ inch thick, it will spread more as it bakes. 6. Bake the cookies for about 15 minutes, until the edges just began to brown. Cool on a baking sheet, then transfer to a wire rack to cool completely. 1. In a medium saucepan, combine the corn syrup and water and bring to a boil. Remove from the heat and whisk in the confectioners’ sugar and vanilla until combined. 2. Melt the chocolate in a medium bowl set over a saucepan of simmering water. Remove from the heat and set aside. Transfer 1 cup of the vanilla icing to the bowl with the melted chocolate and whisk to combine. Add a few teaspoons of milk to the chocolate icing and whisk until it is a similar consistency to the vanilla glaze. 3. Using an offset spatula, spread about 2 T. of vanilla icing over half of the cookie. Scrape the edge of the cookie to catch any excess icing. Place the cookies on a wire rack set over waxed paper and allow to harden for about 15 minutes before using the chocolate icing. 4. Repeat icing the opposite side of the cookie with chocolate. If either icing begins to harden, add a few more teaspoons of milk and whisk to combine. 5. Allow the glaze to set at least 1 hour before serving. The cookies can be stored in an airtight container layered between sheets of parchment paper for up to 3 days. This entry was posted on October 16, 2011 by Spice Is Nice. It was filed under Cookie, Dessert . no chocolate is listed in the ingredients…..but cookies do sound great! Thanks for sharing your site with us! Thanks so much for letting me know! It is updated now.